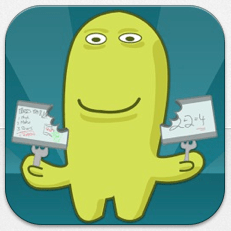 When you work with apps in education there are two different kind of apps. The first ones are those that can do one thing, for instance a calculator (the app myscript calculator is one that you must test if you haven´t done that already), it´s good at what it does, but it doesn´t do anything else. The other kind of apps (open apps) is useful for many different things. There is nothing that says that one is better or worse than the other kind since it all depends on what you want to do. To develop yourself and your education I´d say there is more value from using open apps more, since you and your students will find new ways to use that app. This part of ICT in school will focus on apps that help the learning to become visible. Some of them can be used for flipping the classroom. I´d advice you to let the students make recordings that can be used for other students. The following apps are available for iPad. I do not know which of them that are available for android. Can be used on PC/Mac as well as the app. The teacher uploads an presentation (as a pdf; most tools today can create a pdf from you presentation). Nearpod converts the pdf to a peresentation. After this you can add surveys, examinations, filmclips and elements where the students are supposed to draw on pictures. When you as a teacher activate the presentation you generate a code that the students use to enter. On your screen you´ll see the current slide as well as miniatures of the other slides. When the students interact you as a teacher will get stats on your screen. This means that you get instant feedback and can control if the students understand what you´re talking about. The app is free, but limited. The free version is perfect to test the app before unlocking the premiumversion. Therer are school-licenses as well. I like this app. 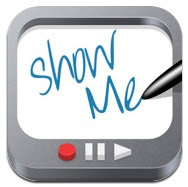 An free interactive whiteboard app that can be used to record whats on the screen (inside the app). You can use a white, aligned, hatched, coordinate system or a picture as background. You can draw using 10 different colors and add sounds. The app ois easy to use. An interactive whiteboard that reminds of Educreations. Explain everything can handle more formats than Educreations when you want to import material (for instance filmclips) to work with. There are more settings which means that you can do more stuff in Explain everything than you can do in Educreations. This app isn´t free, but it has a lot of different uses, so if you buy it you´ll probably end up using it a lot. An app that helps digital collaborative work. You can comment on others recording (after they share the recording) by writing text or by recording videocomments. Requires registration. Another digital whiteboard app. If you install Doceri desktop you can use PC/Mac as well as the app. The app is free, but there is a watermark that you can remove from an in app-purchase. You can record speech as well. Allow you to record your actions when you´re visiting a website, so you can create guides for your students. Another app from the creators of explain everything. Another interactive whiteboard. You publish your recordings at knowmia.com wher eyou also can look at others recordings (more than 15 000 recordings). Free app. Like many of the other apps it´s ll about recording what´s on the screen. They promote that the app is good at working together with pdf (which mean that you can collaborate with many other programs (since many computer programs can produce a pdf nowadays). Not free. Reminds a lot about Educreations. Free app, but has in app-purchase. Free app with really basic structure, which makes it easy to use for younger kids. Good luck using these apps!